"it is easier to turn a historian into a map drawer than an artist into a historian." Been reading entries at the welcome new blog, The Trans-Mississippian, and was interested to see an interview with Donald S. Frazier, who's done such good work on the T-M and the war in the Southwest. Like Drew Wagenhoffer at Civil War Books and Authors, I very much admired Frazier's, Blood and Treasure: Confederate Empire in the Southwest See Drew's review of Frazier's latest, Fire in the Cane Field: The Federal Invasion of Louisiana and Texas, January 1861–January 1863 here—the first of a four book series (The Louisiana Quadrille). What especially caught my eye in the Frazier interview was the fact that he draws his own maps (highly praised in the aforementioned review by Drew). Like Frazier, I learned Adobe Illustrator initially to draft maps for Civil War Regiments journal—it's a great way to go, but mastering the software was not a cakewalk. Indeed, if you're like me, you'll learn just enough to be proficient and to handle specific needs, leaving the vast power and capabilities of the program largely untapped. I wrote about my early map-making adventures back in a 2007 blog entry here. Your book features a number of your own maps. What advice do you have for aspiring mapmakers? Learn Adobe Illustrator. It’s not a real mystery on how to make maps, you just have to be prepared for a bit of a learning curve. I have drawn more than 2,000 maps for various clients world-wide. I discovered it is easier to turn a historian into a map drawer than an artist into a historian. Geography and landforms are the canvas upon which history is painted. You understand how humans interact with terrain, and you will have an instinct for what is important to show on a map. Also, if the place appears in your index, try to make sure at least one map in your book has it located. 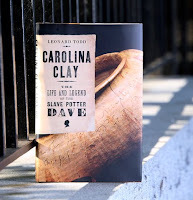 Dave, a slave, was born in 1801 and as a teenager was put to work in a pottery near Edgefield, South Carolina, making stoneware vessels such as jugs and pitchers. Learning to read and write along the way, Dave signed his work, and inscribed it with bits of verse. For over seventy years he created beautiful pieces that are now sought by and exhibited by museums. Now, a descendant of one of Dave's owners, has written what looks to be an intriguing and moving chronicle attempting to piece together the story of Dave's life. I can't get enough of these kinds of explorations and personal discovery, and have ordered a copy of Carolina Clay this evening. I'll report back once I've delved in. Author Leonard Todd is connected to Dave by way of his mother's father's mother's father, a principal owner of Dave at one time. There is a nicely-constructed website promoting the book and the story here, chock full of information on Dave, his pottery, his poems, and the author's personal discovery of a family history comprised of "a long and complex intertwining in which members of my family purchased blacks, whipped them, slept with them, sold them away from one another, tried to prevent them from voting, and perhaps sometimes loved them deeply. 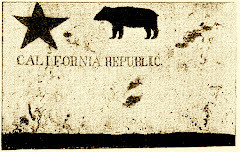 Certain of these blacks supported my forebears with their labor, bore their children, murdered them in anger, killed themselves in protest against them, and perhaps sometimes loved them deeply." That passage alone suggests the author wrote an unflinching account of what he learned, enough reassurance for me to order the book sight-unseen, without fear of enduring an apologist rendering of family legend. 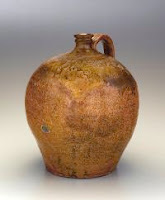 According to the Washington Post's "A House Divided" blog, the author and Smithsonian curator Bonnie Littenfeld will show images of Dave's pottery and discuss his work at a lecture Oct. 14 at 6:45 p.m. (part of the Smithsonian Resident Associate's Prograg). Code 1L0-006. Call 202-633-9467 for reservations.